Hallgrimskirkja and Einar Jonsson Museum (Listasafn Einars Jonssonar) are good opportunities to explore the local culture. Explore Grindavik's surroundings by going to Reykjavik (National Museum of Iceland, The Settlement Exhibition, & more). There's still lots to do: soothe aching muscles at some of the top local wellness centers. To find where to stay, photos, maps, and other tourist information, use the Grindavik vacation planner. Bangkok, Thailand to Grindavik is an approximately 22.5-hour flight. The time zone difference when traveling from Bangkok to Grindavik is minus 7 hours. Traveling from Bangkok in September, expect Grindavik to be much colder, temps between 12°C and 7°C. Finish up your sightseeing early on the 19th (Tue) so you can go by car to Skogar. Take a trip to Skogar for a chance to see a picture-perfect glacier and a collection of waterfalls fed by the Skoga River. Step out of the city life by going to Laugavegur and Icelandic HorseWorld. Change things up with a short trip to Vik Church in Vik (about 30 minutes away). There's much more to do: kick back and relax at Black Sand Beach, admire the sheer force of Skogafoss, tour the pleasant surroundings at Reynisfjara Beach, and don't miss a visit to Crashed DC 3 Plane. To find more things to do, other places to visit, photos, and other tourist information, refer to the Skogar vacation trip planner. You can drive from Grindavik to Skogar in 3 hours. Alternatively, you can do a combination of car and bus. 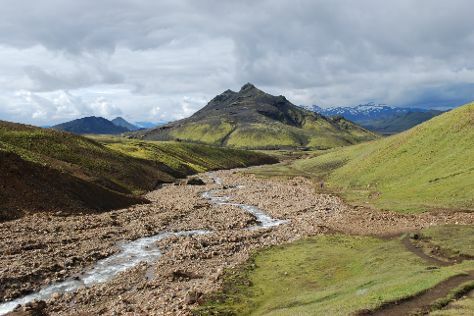 In September, daytime highs in Skogar are 11°C, while nighttime lows are 8°C. Wrap up your sightseeing on the 22nd (Fri) early enough to drive to Blaskogabyggd. Step out of the city life by going to Gullfoss and Strokkur. Step out of Blaskogabyggd with an excursion to Thingvellir National Park in Thingvellir--about 40 minutes away. Spend the 24th (Sun) exploring the striking scenery along Golden Circle Route. To find other places to visit, where to stay, more things to do, and tourist information, use the Blaskogabyggd itinerary planner. You can drive from Skogar to Blaskogabyggd in 2 hours. September in Blaskogabyggd sees daily highs of 11°C and lows of 9°C at night. Wrap up your sightseeing on the 24th (Sun) to allow time to travel back home.